Phantoms# man of the match Ales Padelek is consoled by head coach Slava Koulikov after defeat against Hull. Photo: �2018 Tom Scott. All rights reserved. They went in search of history, but they were left suffering heartbreak. Peterborough Phantoms’ quest for an unprecedented quadruple ended in the most of cruel of circumstances in Coventry yesterday (April 14). Phantoms' Callum Buglass celebrates levelling the scores at 2-2 against Hull. Photo: �2018 Tom Scott. All rights reserved. 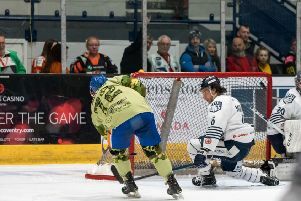 The city team were pipped 5-4 by Hull in an occasionally brilliant and almost always breathless Grand Final of the NIHL Final Four which was settled by an overtime goal. Pirates man Bobby Chamberlain provided the decisive strike just over halfway through the additional five minutes of three-on-three action which had the Skydome crowd on the edges of their seats. A high-scoring contest between two high-class teams seemed inevitable and that’s exactly what the stars of the South and top dogs of the North served up with Phantoms clawing themselves level on three occasions before being undone in sudden-death. They left themselves with a mountain to climb after conceding twice in the space of two-and-a-half minutes early on. The dejected Phantoms await the medal ceremony after their play-off final defeat at the hands of Hull. Photo: �2018 Tom Scott. All rights reserved. Hull import Sonny Karlsson reacted quickest following a face-off to hit the opener before player-coach Jason Hewitt doubled the advantage in a delayed penalty situation following a giveaway by Tom Norton. Corey McEwen steered a glorious opportunity wide as Phantoms searched for a reply, but they began to claw their way back into the contest when Ales Padelek struck from a tight angle. The bar denied the Czech star a leveller but there was no stopping Callum Buglass from equalising in the closing minute of the first period. The young defenceman finished with all the class and craft of a top forward as he collected a James White pass and beat Pirates netminder Ashley Smith from close in. Ales Padelek celebrates Phantoms' first goal against Hull. Photo: �2018 Tom Scott. All rights reserved. Not only did Hull lose their lead, they were also dealt a major blow by the unfortunate exit of Karlsson with blood pouring from his face after being hit by a puck during that opening session. His side were back ahead by the Swede returned sporting a cage during the second period thanks to a goal gift-wrapped by Phantoms defenceman Robbie Ferrara. He surrendered the puck to Lee Bonner who saw his initial shot saved by Jordan Marr, but Chamberlain was perfectly placed to gleefully tap in the rebound. However, Phantoms weren’t behind for long as they came up with another response courtesy of Glenn Billing, who tucked away the puck after a Padelek effort was blocked in traffic. Chances came thick and fast at both ends with Marr doing magnificently to deny former Peterborough man James Archer - a star of their last treble a decade ago - after Martins Susters had slammed over for Phantoms. A smart save by Smith then prevented Padelek from putting the city men ahead for the first time as the clock ticked into the final minute of a frantic stanza. The same exchange came complete with the same result early in the final session as Padelek was again thwarted by Smith while Marr kept Karlsson at bay at the other end. But it was the patched-up Hull forward who emerged victorious when their paths next crossed to put his side ahead for a third time, but Phantoms weren’t about to roll over. Captain James Ferrara was on hand to bring them level again when putting away a loose puck after Padelek’s wraparound shot was saved. A wonderful Marr stop from Chamberlain ensured it remained that way in regulation time but the same Pirates man then settled the issue in overtime after Billing had seen a glorious chance kept out by Smith. While Phantoms missed out on a slice of history, they can take ample consolation from producing a season that will live long in the memory. And they can also hold their heads high in defeat at the hands of an accomplished set of opponents whose success matched their own feat of completing an honours treble. Phantoms and Hullwill be rivals again next season when climbing into the sport’s new second tier. There is only five months to wait for 2019/20 . . .